Railpictures.ca - Bill Thomson Photo: An alternate photo of the rear of the train giving a better view of CN Track Geometry Car 15000, trailing Conrail GP9 7432 and caboose 21541 on the CR CASO Sub a few miles east of Windsor. At the time CN was evaluating the CASO for purchase, which it would do a few years later in a joint acquisition with CP in 1985. 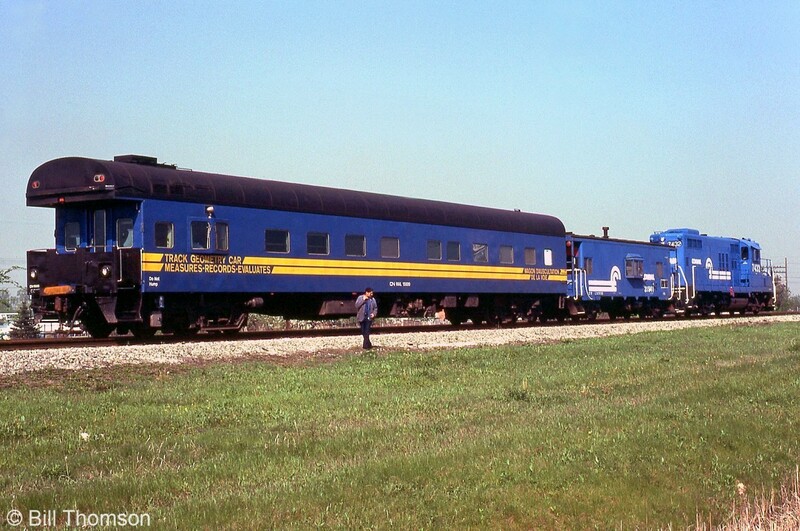 Front view of the train: http://www.railpictures.ca/?attachment_id=34758. | Railpictures.ca – Canadian Railway Photography – photographie ferroviaire Canadienne. Caption: An alternate photo of the rear of the train giving a better view of CN Track Geometry Car 15000, trailing Conrail GP9 7432 and caboose 21541 on the CR CASO Sub a few miles east of Windsor. At the time CN was evaluating the CASO for purchase, which it would do a few years later in a joint acquisition with CP in 1985. Front view of the train: http://www.railpictures.ca/?attachment_id=34758. And what did they do? Leave it to rot.